Last year at the conclusion of the Republican National Convention, The Daily Show co-creator Lizz Winstead and NARAL Pro-Choice America came to town to host a party with Cleveland abortion activists during Donald Trump's official acceptance speech. 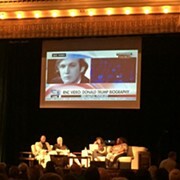 Winstead and a panel consisting of Alonzo Boden, Frank Conniff and Sharron Paul, added satirical commentary during the various speeches. The event provided a scathingly funny critique of the man who would defy all odds (and logic) to become the country's president. Wintead returns to town tonight with Lady Parts Justice League, an organization that aims to expose "sexist anti-choice extremists." 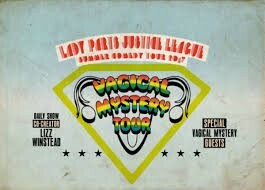 On a tour dubbed the Vagical Mystery Comedy Tour, Winstead performs at 7 at Mahall's 20 Lanes in Lakewood. Tonight's lineup will feature Aida Rodriguez (Shaq's All Star Comedy Jam on Showtime), Buzz Off, Lucille (Upright Citizen’s Brigade) and Joyelle Johnson (Wyatt Cenac).